Beef stroganoff is a classic comfort food that originated in Russia. 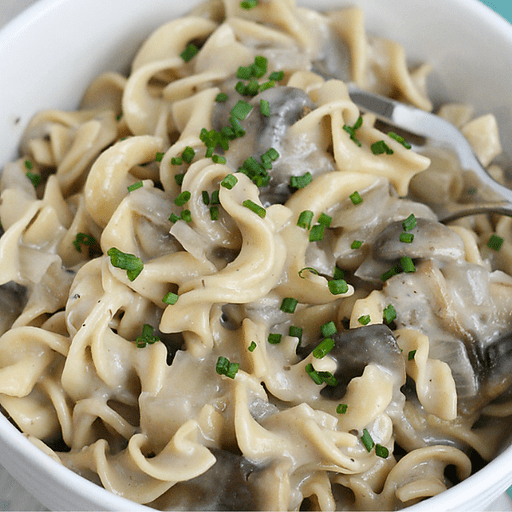 We’ve lightened it up to make this delicious, easy Mushroom Stroganoff that is just as comforting and creamy as the original version. 1. Cook noodles as directed on package. Drain and set aside. 1. Place flour into a medium bowl and slowly whisk in milk until smooth. Whisk in sherry, butter, salt and pepper. Set mixture aside. 1. Spray a large pot with cooking spray and heat over high heat. Add mushrooms and onion and cook, stirring frequently, for 10 minutes or until vegetables are golden brown. Transfer cooked vegetables to a separate bowl and set aside. 1. Slowly add milk mixture into hot pot and cook, whisking frequently, until slightly thickened, about 3 minutes. 1. Add cooked noodles and mushrooms into pot and mix to combine. Stir in Greek yogurt until well incorporated. Sprinkle with chives and serve immediately. Use white wine or vegetable broth in place of sherry. Calories 300, Total Fat 5g (Saturated 2.5g, Trans 0g), Cholesterol 10mg, Sodium 80mg, Total Carbohydrate 48g (Dietary Fiber 3g, Total Sugars 13g, Includes 0g Added Sugars), Protein 19g, Vitamin D 0%, Calcium 15%, Iron 10%, Potassium 15% *Nutritional values are an approximation. Actual nutritional values may vary due to preparation techniques, variations related to suppliers, regional and seasonal differences, or rounding.